THE BAND’S VISIT is immediately striking. Against a vast, monochromatic backdrop, a line of eight men in pastel blue army uniforms stand at attention. They are still and authoritative due to their sheer size and numbers but they are also entirely lost and go almost unnoticed by the few strangers that pass by. The second striking thing about this tiny gem is how incredibly complex it is without seeming the least bit so. Led by Colonel Tawfiq Zacharya (Sasson Gabai), these eight men comprise the Alexandria Ceremonial Police Orchestra. 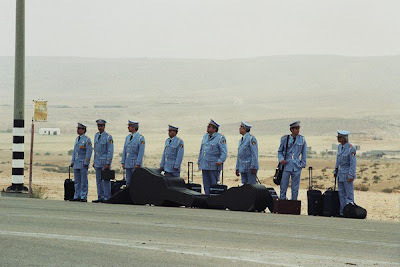 Hailing from Egypt and in Israel to perform at an Arab cultural center, the band find themselves forgotten at the airport and don’t know where to turn. They find hospitality and some much-needed rest in some local townspeople. 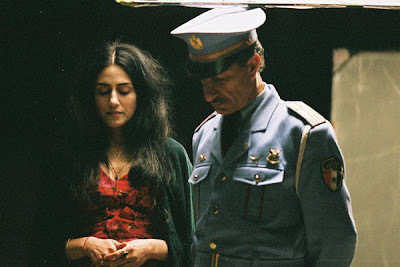 THE BAND’S VISIT is ripe with conflict between these two opposing peoples but deals with all of it with dignity, grace and overall visual lyricism that delights while it enlightens. 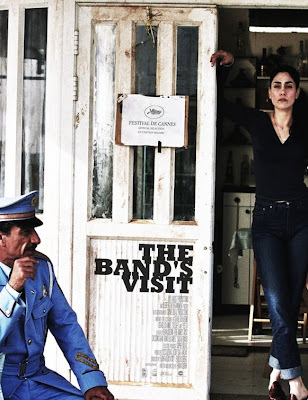 Initially, THE BAND’S VISIT was Israel’s official submission to the Academy Awards but was eventually disqualified because over 50% of the film’s dialogue is in English. Israeli’s and Palestinian’s trying to communicate with each other and having to settle for broken English seems like a pretty foreign notion to me but I’m not a voting member of the Academy. (The film went on to win 8 out of the 13 nominations it received at the Israeli equivalent of the Oscars, including awards for the three main actors, the director and the film itself.) No matter as the film found a warm, embracing audience around the world regardless and with its recent release on DVD, has the potential to reach even more. Once in people’s homes, audiences will get the pleasure of watching an appreciative cast and crew in a making of (and unfortunately little else). Interviews with all the major cast members, as well as the director and score composer shed light on what it meant to be a part of such a multi-cultural collaboration and how they didn’t want this to be an issue film. Director and writer, Eran Kolirin certainly succeeded in avoiding the issues by weaving them seamlessly into the fabric of these people’s existences instead of dealing with them directly in dialogue. The result is an awkward overnight stay that allows for all involved in this potentially tense scenario to let down their uniformed guards and find the peace within through music.